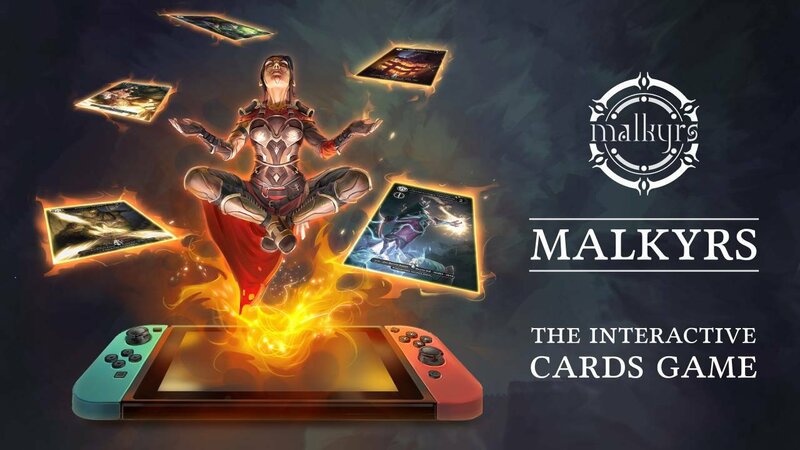 Malkyrs: The Interactive Card Game is a virtual trading card game complete with customisable physical cards, and it's headed to Nintendo Switch next year. Thanks to the NFC technology built into the Switch's Joy-Con (the same tech used for scanning your amiibo) these physical cards can be played by placing them on your controller, with the full game reacting on screen as you do so. The game itself is a narrative-driven affair as well as a competitive card game for one to two players - each player can use weapons, magic, and tricks in an attempt to escape the game's fictional island - and each copy comes with an initial set of 262 cards. The game has just seen a Kickstarter campaign be launched, with its target being smashed in just a few hours. A Switch version has already been secured thanks to this funding and you can learn all about the game (as well as support the project) via its campaign link. If you want to see it in action, make sure to check out the video below. It starts with a cinematic opening to show off some of the lore behind the game's world, before explaining how everything works and what's included. With cross-platform play and trading features also available, this one looks like it could be a real winner when it arrives next year. The game is scheduled to launch on Switch in Q3 2019. What do you think? Will you be backing the project? Let us know with a comment below. I'm surprised they never did this for a Pokémon Trading Card Game remake or modern update. Hard pass. I don't like TCGs unless it's full digital. Nintendo made a patent a while back for something similar to this. It makes me hope that we will be getting a Nintendo card game for the Switch sometime in the future. Whether its a Super Smash Brothers card game, or a Switch version of the Pokemon trading card game. @AxeltheBuizel The problem with this for existing TCG games is that most games require you to draw from a deck. That becomes impossible to control without some kind of linked shuffler. Otherwise you just stack your hand with the cards you need all the time. @Shadowkiller97 how I thought it would work is that you can scan the card once and you can use it without scanning it again. Were you thinking of the physical card game, because I was referring to the Game Boy Color game. @Shadowkiller97 I was just about to comment that I hope they put alot of thought into how the game is played due to that exact reasoning. The mobile Pokemon card game gets a pass since you just purchase decks on the app and play it all virtually. But to play with your deck live just won't be fair. I mean if you played it locally with other people it could work, but online multiplayer definitely wouldn't. Woah yeah..... why hasn’t more like this come out?!!?! It’s actually brilliant, I would definitely get a Pokémon game or something else. If it had amiibo support, that would make all too much sense. "Exclusive cards" - I hate it already. Also the name sounds like someone trying to say "martyrs." I always wanted a trading card game version of Animal Crossing: Welcome Amiibo. But couldn’t you just play the card game physically play the game instead of wasting time doing it virtually? I'm not impressed. I like the idea of a TCG on the Switch (bring me a proper Yugioh or MTG game) but a physical TCG and software hybrid game has never worked (Looking at you Eye of Judgement). It's a neat concept but it could never work. @BubbleMatrix82 I have EYE, but never played it. Tech has come a long way since then. I wish more card games would get behind this. If magic did this I would start playing again. I think I need to avoid this. It's bad for my wallet. Oh wow! So it's not broken how that YTber was demonstrating it, I will definetly play this game! Thank you! So... can the game be played without the Switch or do you need both? Does it have online play? Kinda mixed feels on this one. There's more than enough digital TCGs out there that you can try & put down for a while without leaving even more excess cards laying around from your physical TCG days. @AxeltheBuizel I've been saying that for years. Ever since Amiibo were first announced, and doubly so when they did the Animal Crossing cards. The only thing I can think of, is Game Freak is still sorely aware of how badly the e-Reader failed back in the day. But I really feel like they could have done a lot with it, and still hold out hope that we might see Amiibo functionality of some sort with the 2019 main series game. I could see Amiibo cards coming 1 per pack, in the "reverse foil" slot and special cards could allow you a chance to catch Pokemon in game, or earn you items.